With cycling gaining popularity, seeing more and more weekend warriors, commuters and racers take to the bike, it’s not surprising that bike theft is on the rise. A trip to the shops, the cafe run and even the cycle to work requires us to leave our beloved bikes locked up, usually out of sight, but certainly not out of mind. It seems crazy to us here at CW that riders spend thousands on bikes and equipment and then pittance on a lock that takes, in some cases, longer to put on than cut off. The startling Gone in 60 seconds film shows that, in lock terms, you really do ‘get what you pay for’. It’s not only Joe Bloggs that is affected by bike theft. A lorry load of bikes was stolen from outside the Trek UK offices in Milton Keynes last weekend [October 26] with a shipment of Trek’s 2013 range taken. Trek have asked if the cycling community can be vigilant as the bikes that have been stolen may show up in bike shops for repair or builds, or on auction websites such as Ebay or Gumtree. If you do have any information regarding the stolen bikes or think a stolen bike is being offered for sale contact Trek UK – 01908 360 160. In the past, cyclo-cross has always been treated as a fun winter challenge for those seeking motivation and it terms of products, it’s like being the little brother using hand-me-downs from road and mtb machines. But now, times are changing and with the growing fan-base, participation numbers and races to boot, companies are listening to riders. 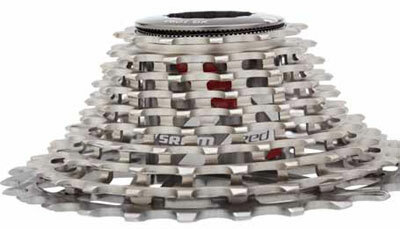 SRAM, with their ears firmly on the ground, have released the X-Glide 1090, a redesign of the Powerdome X road cassette, offering a flushable system, which is said to allow grime to disburse away from the drivetrain. 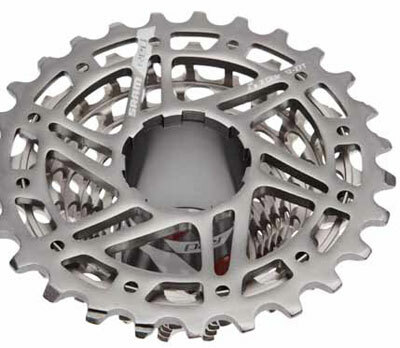 Extra milling between gears and a more open cassette keeps it light, whilst the close range 12-27 ratio never leaves you lost for the right gear. Expect to purchase for around £240.